There are only a very few things that will completely prevent Kerio Connect Mailserver from starting. Usually this would come from a confused or mangled configuration file, but there are other conditions that can cause Kerio to refuse to start. By the way, the easiest way to find out what is stopping the startup is to look in Kerio's error log. On a Mac, you'll find mailserver/store/logs under /usr/local/kerio, on Linux it will be under /opt/kerio, and on Windows it's Program Files/Kerio. The error log is "error.log" and it is plain text. However, there's one condition where that won't help you. If Kerio's "store" directory isn't where the config file says it is, Kerio won't be able to start and also won't be able to find its log directory to write the error. However, if you try starting Kerio from the command line, you will see the error. it before you start the server. I had this happen with a customer just this week. He was doing some maintenance unrelated to Kerio but when he rebooted, Kerio failed to start. The reason was that Windows changed drive letter assignments: the Kerio store had been configured on the F: drive, but got moved to H: as a result of the maintenance. The fix for that was to edit the mailserver/mailserver.cfg file manually and change the drive letter. The config file is just an XML text file; the "StoreDir" variable is what you'd need to fix. Of course that's true for any service you need. A running webserver will prevent HTTP or HTTPS from starting and leave you with the same problem: identify the process that is conflicting, stop it, and prevent it from starting up again. How you do that is operating system specific and even then there can be odd circumstances that could make it difficult to track down the offending process or application. If you can't easily identify the problem, give me a call and I will help you track it down. The mailserver needs to go out on port 25 (unless you use a SMTP relay at some other server). Some ISP's block 25 and other mail ports; make sure you can use the ports you need. You may have a scanner or some other device that wants to use the mailserver. Usually that's trivial, but it can be more complicated. Most problems I've seen are simple mistyping errors or incorrect DNS. Other problems usually involve delivery (or non-delivery) of mail. Why can't I send mail to Mary Jones? Why can't Mary send to me? 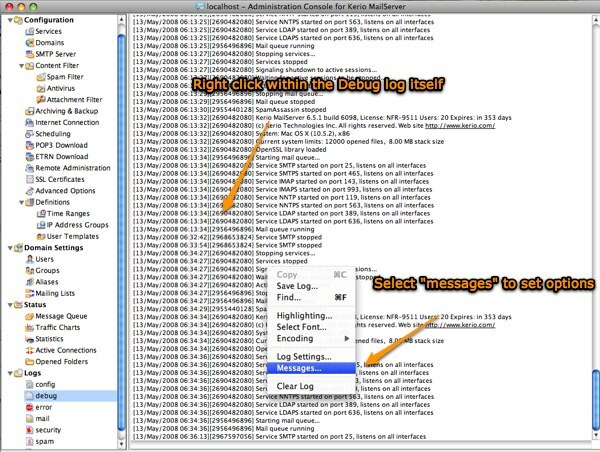 Usually the logs (mail.log, error.log, security.log and spam.log) will show the reason: you mistyped Mary's address, Mary's domain is on a blacklist..
A couple of things to keep in mind in this area: if there is no record in any log of a connection from samplesite.com, then whatever mail they tried to send to you simply never got to your server. Maybe it's their DNS, maybe there is a bad router between you and them, but whatever it is, it never got to you. There would ALWAYS be a log entry of some sort if the mail got to your server. The same is true for outgoing mail. If a user says they sent mail to maryj@samplesite,com, but you can't find any such thing in the Kerio logs, the problem is back at their machine, not within Kerio. Of course there usually will be a log entry, and that will show you where the problem is. In the case of sending mail, look in the Message Queue (Under "Status" in your Kerio Administration Console). If the message is stuck in the queue, the other server may just not be up and running right now or there may be routing problems preventing your server from reaching it. That assumes that the original message was correctly addressed: many times I have found log entries showing that the user tried sending to "maryj@samplesite.com" when the real address was "maryj@samplesite.org" or was simply mispelled. Note that when you see "Delivered" in the mail log, that's followed by a "Status". A status of 2.0 means that the message was delivered correctly (incoming mail) or passed to the relay server correctly (outgoing mail). A status of 2.1 on an incoming email indicates that the message was delivered to the mailbox, but a filter or rule then moved the email out of the Inbox to another folder. See also Troubleshooting failed email. That will bring up a window that can turn on extra debugging for a number of functional areas. Usually you'd only do this at the request of a support technician, but there's no harm experimenting with this yourself if you are technically minded and curious. Outlook is a complicated product and adding Kerio's Outlook Connector doesn't make it any less so. Recent versions are actually two separate processes: the Connector itself (KoffBackend.exe) and the "Updater" service (ktupdaterservice.exe). If you are experiencing difficulty, stop Outlook and the Updater service in Services) and try reinstalling. That sometimes fixes strange problems, as does simply creating a new profile. Remember, everything is stored on the server, so the only thing you lose is time. 1. Delete any existing Outlook profiles on this user's PC. 3. Make sure Outlook is fully patched and up-to-date. 5. Create a new Outlook profile WITHOUT email support. 6. Open the empty profile then close it down. 7. Install KOFF by opening a browser window and going to the webmail login page - click on the "Integration with Windows" link. 8. Install Outlook profile from the link "Click here to auto-configure Kerio outlook connector" - Same page where you downloaded KOFF above. Outlook synchronizatio stalled or slow is almost certainly a network problem. 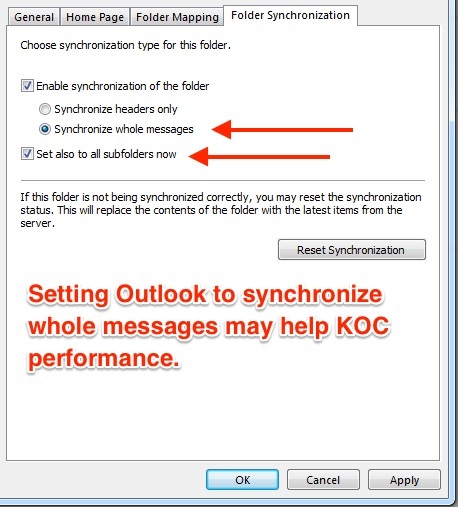 I've seen some really strange ones:Troubleshooting Outlook KOC problems on new Windows 7 machines, for example. Also see Outlook doesn't start. and Outlook Connector is crashing or hanging! If you need help from Kerio, they may want Outlook logs. See this page for suggestions. Payment Card Industry Data Security Standard (PCI DSS) is a proprietary security standard required by some banks in order to allow the company to process and store data about credit cards and payments. See Kerio Connect and PCI for details. Also see this discussion on Diffie Hellman Key Exchange. Someone mentioned this “Can’t Create File" Error When Opening Attachment. Unless something really is sending the same message more than once, this indicates a network problem - the recieving server accepted the message, but the sender never saw the packet that acknowledged the receipt. I've seen this caused by an SMTP protocol inspector on a firewall, but also see Android phone crashes email account. Most mail problems are easily identified and quickly solved. Of course there is always the possibility that your problem is an actual Kerio bug. That hasn't happened very often, but you never know when some odd combination of circumstances may bring a bug to the surface. Kerio's Product Forums often contain late breaking news and discussions that may be helpful. For example, Microsoft patches can sometimes have unpleasant results - you'll often find out about this kind of thing in the Forums. The Knowledge Base is also a good place to look for help. Your issue may be well known and a simple fix may be found here. You can open a Kerio support ticket on-line or just call them directly. If you need help and you are one of my customers, of course you can call me. Actually, I'd like to know about any problems even if you choose to go directly to Kerio support. It may be that I know the answer and can react more quickly, but even if I do not, I want to be involved and on top of the situation. You may not ever have any real problems with Kerio Mailserver, but if you do, I hope this article helped. See Microsoft's Connectivity Tester also. Clearing the server side and local side cache at the same time can sometimes be needed. See if this helps as some times if the data is corrupted one side and both sides are not cleared the problem can re-sync to the other end.